Human reaction time is defined as the time elapsing between the onset of a stimulus and the onset of a response to that stimulus. A primary factor affecting a response to stimuli is the number of possible stimuli or in volleyball’s cases what you “Read” your opponent doing. In 1952 a researcher named Hick confirmed that by going from one response choice (Decision Step) to two, response time increased by 58%. 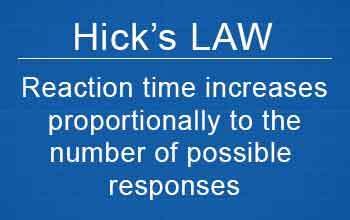 Hick’s discovered that the reaction time increases proportionally to the number of possible responses until a point at which the response time remains constant despite the increases in possible responses. This is widely known as “Hick’s Law” and has been repeatedly confirmed by subsequent research. A volleyball player is “Reading the Game” using the OODA Loop on defense in beach volleyball. First they Observe the attacker spiking the ball at them. Next they Orientate or process what they see. Before Acting or Perform the Volleyball Skill of digging the ball on defense. If during the orientation phase (Step 2) the player cannot effectively process the information and the result they perceive two possible outcomes / shots, for example in beach volleyball a line shot and a hard driven ball, their reaction time will increase by 58% verses them Orientating / Processing or “Reading the Game” for only 1 shot. 58% Increase in Response Time with just Two Outcomes! Now consider if they perceived three shots, a line shot, a hard driven ball and a cut shot, or even four shots, add a jumbo shot. Their reaction time has increased well over 100% of that had they only READ / ORIENTATED one shot. The result is them essentially being stuck, unable to react fast enough to get any ball often even if it has been hit directly at them. When you really think about this, this is extremely powerful and why I advocate for training volleyball skills using the OODA loop and Orientation as the most important point in the loop! Quick Beach Tip: I was filming AVP and FIVB Pro Jason Lockhead on Beach Defense last year and one of his tips for defense, “Always plan on taking only two balls on defense.” – Jason Lockhead. Now that you know Hick’s Law why do you think he believes this? Also be sure to look at my article on strategy for using “Hicks Law” to OODA Loop your opponent. Are you looking for that edge this year to help your player’s performance at a higher level? Are you looking for new exciting insights into coaching volleyball that will pay dividends for years to come? Andor Gyulai will be visiting High Schools and clubs across the country this summer sharing his teaching methods of the OODA Loop and “Reading the Game”. Click Here to request more info and schedule a call with Andor Gyulai personally to hear how he can help you and your program with new added resources for beach and indoor volleyball.